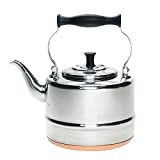 Want to see the best BonJour Teapots & Tea Kettles available. 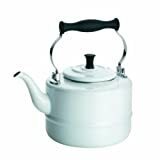 Check out our Top 10 BonJour Teapots & Tea Kettles list. The zen teapot is the excellent fusion of strength and beauty. Elegant hand blown glass design accented by a classic bamboo handle rests on an elevated bamboo base. Featuring a borosilicate glass body and a removable stainless steel micromesh handle, bamboo stand and tea scoop. Borosilicate glass resists shock and breakage. 42-ounce/1.2 liter capacity. With accessories ranging from tea and coffee pots to wine cellars and salt vaults, BonJour gives you the gourmet tools you need to sit back and drink in the moment. Making a cup of tea in this stunning stainless steel teakettle will become a esteemed ritual. 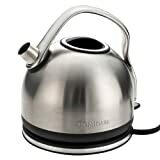 The kettle features a full cap copper base for quick and efficient heating and the durable, polished stainless steel exterior is stain resistant and a breeze to clean. A drip free pour spot allows you to conveniently pour hot liquids with ease and efficiency. Stainless steel and rubberized handles are riveted firmly into place for safe pouring while the secure fitting lid seals in heat. 2 quart capacity. Crafted for brewing tea in classic infusion-style, Bonjour's beautifully unique and elegant double wall insulated ribbed teapot features a clear borosilicate glass pot with a transparent glass infuser to enhance everyday tea drinking and ensures a chic touch to tableside tea service when entertaining. Intended for loose teas, this insulated teapot will allow you to keep freshly brewed tea piping hot longer. Borosilicate glass resists shock and breakage. 31-ounce/ 930ml capacity. Brewing tea Leaves for perfectly flavored beverages is easy with the dapper BonJour tea glass Prosperity teapot. 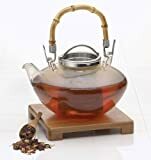 Constructed of borosilicate shatter-resistant glass with an exceptionally durable plastic frame, this 42-Ounce glass teapot features a patented, BPA-free shut-off infuser to allow control over flavor. Whether it’s acai blueberry white tea, English breakfast or chai rooibos, simply place your beloved loose leaf tea in the infuser and fill the carafe with hot water. Holes in the infuser basket allow tea Leaves to come into contact with the heated water. And after steeping the tea to the desired strength, the filter can be plunged to seal the Leaves inside a solid chamber, stopping the brewing process. Featuring a stay-cool handle and built-in coaster, this convenient glass teapot creates five full Cups of flavorful tea to share with family over breakfast, or with friends in the afternoon. And the teapot is dishwasher safe for convenience. An ideal addition to kitchens of tea enthusiasts, this glass teapot makes a great partner to other tea, Coffee and beverage service items in the BonJour collections. Enjoy a variance of beloved tea blends that can be brewed to the immaculate, preferred taste in the attractive BonJour tea glass Prosperity teapot. With accessories ranging from tea and coffee pots to wine cellars and salt vaults, BonJour gives you the gourmet tools you need to sit back and drink in the moment. This modern brushed stainless steel tea kettle is a revolutionary cordless design with a 360-degree, cool to touch detachable base. The concealed heating element never comes in contact with water, eliminating mineral deposits to ensure better flavor. A powerful 1500-watt heating element boils water quickly with automatic shut off and a built in boil-dry safety mechanism. Premium stainless steel fittings are completed with conveniences such as: exterior water level gauge, tight fitting lid, removable filter and easy cord storage in the base. 1-1/2-liter capacity.